Changes in the course have made it more attractive to aggressive players looking to pick up a stroke early on, which could turn out to benefit the younger players. And although par-5s will still be huge opportunity holes, players might use the more-condusive course to attack par-3s a little more aggressively, spelling dramatic holes-in-ones. Although there have only been 21 holes-in-one over the course of 75 tournaments, this could be as good a year as any for aggressive shots on the historically unforgiving greens. History suggests players have already been taking advantage. A third of the previous holes-in-ones have occured in the last eight years alone. Six of those were surrendered by the 16th hole, nestled in between a sloping green and a bunker and water on the right. 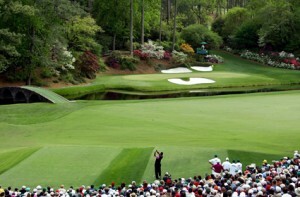 Targeted by players as a huge opportunity hole, it has been attacked more than any other par-3. Although 15 is a par-5, it’s so difficult many players just pass up the opportunity to pick up a stroke and settle for par. They try to make it back on 16. It’s no wonder sportsbooks think 16 is the most-likely hole to surrender the first hole-in-one. In fact, the +225 payout on Bovada is an overwhelming favorite over the 6th (+700), 12th (+1000) and 4th (+16000). 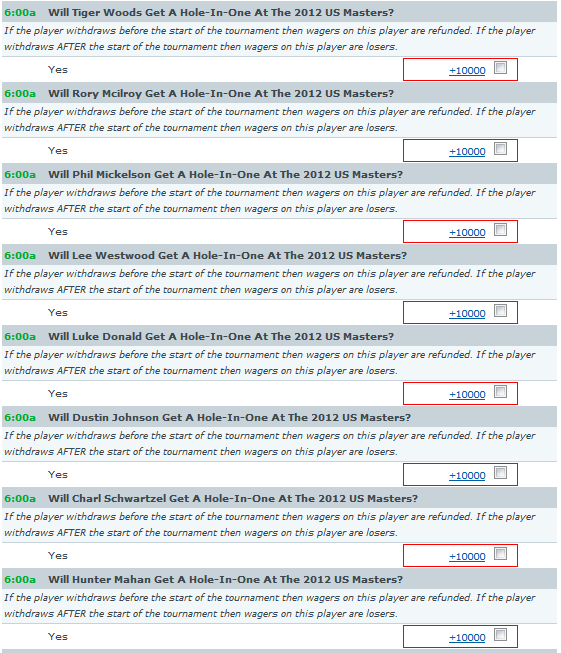 Then again, Bovada is actually predicting there will be no hole in one (-150), but that wouldn’t be nearly as much fun. Below we have these props listed for you as seen on Bovada.